The Hong Kong Civil Aviation Department released the final investigation report into the serious incident involving an Airbus A340 that attempted to take off from a taxiway. The serious incident occurred on November 27, 2010. The incident flight involved a Finnair Airbus A340-313X which operated on flight AY070 from Hong Kong-Chek Lap Kok International Airport (HKG/VHHH) to Helsinki-Vantaa Airport (HEL/EFHK). The incident occurred at night time and in good visibility conditions. One of the runways was closed for maintenance. The north runway (07L/25R) remained operational with runway 07L in use for both arrivals and departures. Flight 070 was cleared by ATC to taxi on taxiway B westbound for departure on runway 07L. When the aircraft was approaching the western end of taxiway B, ATC cleared the aircraft for take-off on runway 07L. The aircraft took the normal right turn at the end of taxiway B towards runway 07L but then took a premature right turn onto taxiway A, a taxiway parallel to and in between the runway-in-use and taxiway B. With the help of the Advanced Surface Movement Guidance and Control System (A-SMGCS) provided in the Control Tower, ATC observed that the aircraft commenced take-off roll on taxiway A. On detecting the anomaly, ATC immediately instructed the pilot to stop rolling and the aircraft was stopped abeam Taxiway A5, approximately 1400 metres from the beginning (western end) of taxiway A. A combination of sudden surge in cockpit workload and the difficulties experienced by both the Captain and the First Officer in stowing the EFB computers at a critical point of taxiing shortly before take-off had distracted their attention from the external environment that resulted in a momentary degradation of situation awareness. The SOP did not provide a sufficiently robust process for the verification of the departure runway before commencement of the take-off roll. The safety defence of having the First Officer and the Relief Pilot to support and monitor the Captain’s taxiing was not sufficiently effective as the Captain was the only person in the cockpit trained for ground taxi. On October 19, 2009, about 06:05 a Boeing 767, N185DN, operating as Delta Air Lines flight 60, landed on taxiway M at Atlanta-Hartsfield-Jackson International Airport (ATL), Georgia. No injuries to the 11 crew or 182 passengers were reported, and the airplane was not damaged. Night visual meteorological conditions prevailed. During the descent and approach, the flight crew was assigned a number of runway changes; the last of which occurred near the final approach fix for runway 27L. While the flight was on final approach, the crew was offered and accepted a clearance to sidestep to runway 27R for landing. Although the flight crew had previously conducted an approach briefing for runways 27L and 26R, they had not briefed the approach for runway 27R and were not aware that the approach light system and the ILS were not available to aid in identifying that runway. The captain maneuvered for the sidestep from runway 27L to 27R and lined up on “the next brightest set of lights” he saw. The first officer was preoccupied during the final approach with attempting to tune and identify the ILS frequency for runway 27R. Just prior to the airplane touching down, the captain realized they were landing on a taxiway. The airplane landed on taxiway M, 200 feet north of, and parallel to, runway 27R. The local controller did not notice the crew’s error until after the airplane had landed. The taxiway was unoccupied, and the flight crew was able to stop the aircraft safely and taxi to the gate. The National Transportation Safety Board (NTSB) determined that the probable cause of this incident was the flight crew’s failure to identify the correct landing surface due to fatigue. the combination of numerous taxiway signs and intermixing of light technologies on the taxiway. The Hong Kong Civil Aviation Department released a preliminary investigation report into the serious incident involving an Airbus A340 that attempted to take off from a taxiway. The incident occurred at night time and in good visibility conditions. Flight 070 was cleared by ATC to taxi on taxiway B westbound for departure on runway 07L. When the aircraft was approaching the western end of taxiway B, ATC cleared the aircraft for take-off on runway 07L. The aircraft took the normal right turn at the end of taxiway B towards runway 07L but then took a premature right turn onto taxiway A, a taxiway parallel to and in between the runway-in-use and taxiway B. With the help of the Advanced Surface Movement Guidance and Control System (A-SMGCS) provided in the Control Tower, ATC observed that the aircraft commenced take-off roll on taxiway A. On detecting the anomaly, ATC immediately instructed the pilot to stop rolling and the aircraft was stopped abeam Taxiway A5, approximately 1400 metres from the beginning (western end) of taxiway A.
Whilst the investigation is still in progress, the Investigation Team considered it prudent to institute a temporary ATC procedure to minimize the possibility of recurrence. In this connection, Hong Kong ATC, as an extra precautionary safeguard, issued an Operational Instruction on 29 November 2010, which required that during runway 07L operations, the Air Movements Controller shall withhold the take-off clearance until ascertaining that the aircraft has completely crossed taxiway A. 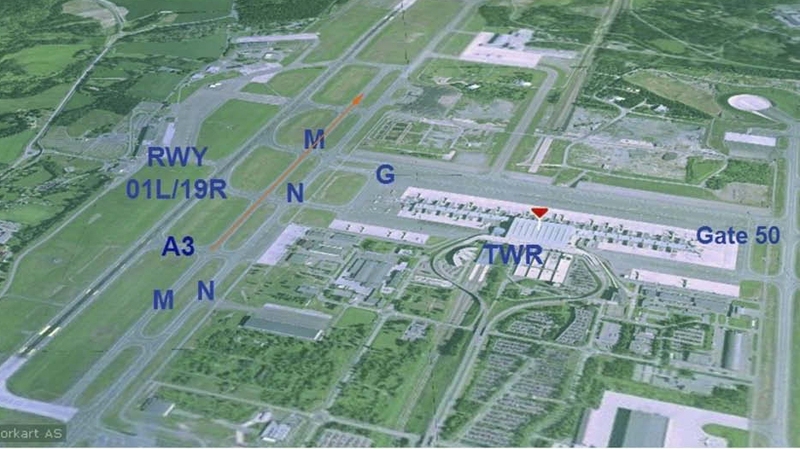 An investigation report by the Accident Investigation Board Norway (AIBN) concluded that the airline, airport and controller were all factors in a serious incident at Oslo-Gardermoen Airport when an Aeroflot Airbus A320 took off from a taxiway. The serious incident occurred on 25 February 2010. Aeroflot flight number AFL212, an Airbus A320 aircraft, made a taxiing mistake and took off from taxiway M instead of runway 01L. There were three pilots, four cabin crew members and sixty passengers onboard. After the incident, the flight continued as planned to Moscow. The flight crew was not aware that they had taken off from the taxiway until informed of this by the air traffic controller after take-off. Under the prevailing conditions, taxiway M was by chance long enough for the aircraft to take off. The taxiway was at the time of the incident also free of other traffic and obstacles. This prevented a more serious outcome of the incident. The investigation has uncovered several causes for AFL212’s taxiing mistake and take-off from the taxiway. The factors which contributed to the events can be found with the parties involved, i.e. the airline, the control tower and the airport. The Accident Investigation Board is of the opinion that deficient procedures and insufficient alertness in the cockpit, in combination with insufficient monitoring from the control tower and insufficient signposting in the manoeuvring area, resulted in AFL212 making a taxiing mistake and taking off from taxiway M.
On the basis of the investigation, the Accident Investigation Board has issued a safety recommendation to the airline involved, Aeroflot Russian Airlines. As the airport has already implemented measures to prevent similar incidents, and the Civil Aviation Authority has reopened an earlier safety recommendation from AIBN to Avinor, no further safety recommendations were issued. The Accident Investigation Division of the Hong Kong Civil Aviation Department, HKCAD has launched an investigation into a serious incident in which an A340 attempted to takeoff from a taxiway. The incident happened on November 26, 2010 as Finnair Flight 70 was cleared to takeoff at Hong Kong-Chek Lap Kok International Airport. The tower controller noted that the flight was starting the takeoff roll from the parallel taxiway and instructed the crew to abort the takeoff. There were no injuries or damage. The airplane involved in the incident was Airbus A340-313X registered OH-LQD. The occurrence was classified as a serious incident as is under investigation by the Accident Investigation Division of the Hong Kong Civil Aviation Department, HKCAD.